New state-of-the art gas carburising and hardening Ipsen Sealed Quench furnace expands P.H. 's capacity by up to 32%. New atmosphere tempering furnace for scale-free tempering of steel. The new plant is able to process batches of up to 1 ton per load under atmosphere with sealed quenching. Components of up to 760mm can now be done vertically to minimize distortion. Maximum component length of 1220mm can be heat treated under controlled atmosphere. Computer-based order tracking, monitoring and management system introduced. The system was designed in-house by P.H. Heat Treatment for commercial heat-treaters. All of the above have resulted in greater competitiveness and improved customer service. P.H. Heat Treatment has expanded its operation with the purchase of a modern high tech 25 cu.ft. 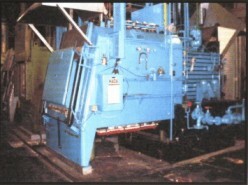 Ipsen sealed quench furnace and an associated atmosphere tempering furnace. This new addition to P.H. 's existing family of 24 assorted furnaces, will increase capacity for atmosphere-based heat treatment by a whopping 32%. In addition to the increased capacity, the corporation will now be able to heat treat components to vertical height of 760mm. and can accommodate furnace loads of up to 1 ton each. The sealed quench furnace is elecrtically heated making it very fuel efficient. It uses the tried and tested Afrox Endomix system for heated treatment and treatments offered by the corporation include atmosphere normalizing, neutral hardening and scale-free annealing as well as the full range of case hardening treatments including our range of innovative licensed Omega processes. Control of the furnace temperature is by using modern thyristor control and the carbon potential in the furnace is fully automatic, as is the case with existing furnaces at P.H., the new furnace will be environmentally friendly and free from pollution, messy and toxic salts and hard to remove effluent waste. Furthermore the new plant underscores P.H. 's commitment to high tech heat treatment in line with the best in the world. The temper furnace runs with a nitrogen-based atmosphere and produce scale-free tempering. The corporation has designed its own data-based computer system to track and control all orders received from customers. pricing, invoice control, proof of delivery and transport. The system allows for complete traceability in line with the quality management system at P.H. The information system also provides an excellent management tool for the servicing of customers and has resulted in major improvements in customer service.